Sunset illuminates the promenade of Alexandria's waterfront. 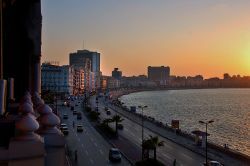 Alexandria, with a population of 4.1 million, is the second-largest city in Egypt after Cairo. It is the country's largest seaport, serving in excess of 50 percent of all of Egypt's imports and exports. It is home to the Bibliotheca Alexandrina, the New Library of Alexandria, and is an important industrial center because of its natural gas and oil pipelines from Suez. Alexandria extends approximately 25 miles (40 km) along the coast of the Mediterranean Sea and is built partially atop the famed ancient city. Ancient Alexandria was a thriving Greco-Roman city, one of the most famous cities in the world. It was founded by Macedonian ruler Alexander the Great, and was home to a substantial number of Jews and Greeks who lived and worked with their Egyptian counterparts, signifying the place where Western civilization touched base with African and Asian civilizations. Renowned throughout the ancient world as an international center of culture and learning, it remained Egypt's capital for nearly a thousand years. Known for the Lighthouse of Alexandria (one of the Seven Wonders of the Ancient World), the Library of Alexandria (the largest library in the ancient world), and the Catacombs of Kom el Shoqafa (one of the Seven Wonders of the Middle Ages), its history continues to be discovered. Ongoing maritime archaeology in the harbor of Alexandria (which began in 1994) is revealing details of the city both before the arrival of Alexander, when a city named Rhakotis existed there, and during the Ptolemaic dynasty. Though perhaps most widely known for its role in the ancient world, it is considered Egypt's "second capital" and contributes substantially to both the national economy and its identity. Alexandria, named for its founder, Alexander the Great, extends along the coast of the Mediterranean Sea in north-central Egypt about 114 miles (183km) northwest of Cairo. It lies at the western edge of the Nile River delta on a strip of land between Lake Maryut and the Sea. It extends 25 miles (40km) east to west along a limestone ridge, approximately 1-2 miles (1.6–3.2km) wide. A narrow isthmus connects the former island of Pharos with the city center on the mainland, and separates the east and west harbors. The west harbor, which serves as the city's port is protected on three sides from Mediterranean storms. 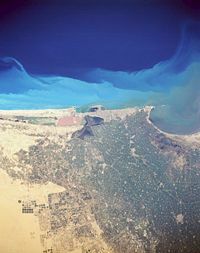 Alexandria from space, March 1990. The city has a pleasant Mediterranean climate. August, its hottest month has an average temperature reaching 87°F (31°C), while January, the coldest, averages 64°F (18°C). Winters are cool and stormy, with torrential rain and hail. The city covers 116 square miles (300 square kilometers). The commercial center is Sa'd Zaghlul Square, where the Cecil and Metropole hotels are located, and inland toward the railway station. Urban development spreads east, both inland and along the Corniche, a seaside promenade, which is a ribbon of beach huts, bathing clubs, and restaurants, with a wall of hotels and apartment blocks across the road. Modern Alexandria is divided into six blocks: Montaza, population 943,100; Eastern Alexandria, population 933,600; Middle Alexandria, population 566,500; Amreya, population 457,800; Western Alexandria, population 450,300; and Gumrok, population 186,900. Alexandria has been blamed for pumping large quantities of sewage into the Mediterranean; pollution of the beaches is a continuing health hazard. 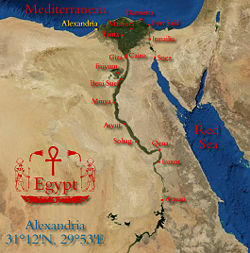 Alexandria was founded, possibly in 332 B.C.E., by Alexander the Great, king of Macedonia, who planned it to be the link between Greece and the rich Nile Valley. The site had abundant water from Lake Maryut, and good anchorage provided by the island of Pharos. An Egyptian townlet, Rhakotis, which had existed on the shore since 1500 B.C.E., was filled with fishermen and pirates. 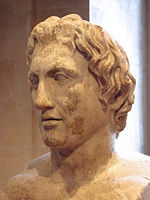 Alexander's chief architect for the project was Dinocrates. A breakwater nearly one mile (1.6km) long called the Heptastadium (“seven furlongs”) was built to the island of Pharos, enclosing a spacious harbor. A lighthouse, one of the Seven Wonders of the Ancient World, was built on Pharos. Another smaller harbor was open to the west. A canal was built to join Lake Mareotis to the Canopic branch of the Nile. A few months after the city's founding, Alexander left Egypt for the East and never returned to his city. His viceroy, Cleomenes, continued the expansion of the city. When Alexander died in 323 B.C.E., control of the city passed to his viceroy, Ptolemy I Soter. The Ptolemies built numerous palaces, founded the Alexandria Library, which held nearly 500,000 volumes, the largest collection of books in the ancient world, and the Alexandria Museum. Influential schools of philosophy, rhetoric, and other branches of learning were established. Top thinkers residing there included geometer and number-theorist Euclid, as well as Archimedes, Plotinus the philosopher, and Ptolemy and Eratosthenes the geographers. In a century, Alexandria had become the largest city in the world and for some centuries more, was second only to Rome. The city was also home to the largest Jewish community in the world and was a center of Jewish learning. The Septuagint, a Greek translation of the Hebrew Bible, was produced there. The city passed formally to Roman jurisdiction in 80 B.C.E., according to the will of Ptolemy Alexander, but only after it had been under Roman influence for more than a hundred years. The last of the Ptolemies, Cleopatra (69 B.C.E.–30 B.C.E. ), entered into a relationship with Gaius Julius Caesar, which produced a son, and, after Caesar's assassination, aligned against Octavian, who was to become Emperor Augustus, with Mark Antony, with whom she produced twins. Augustus brought Alexandria, which controlled the Egyptian granary upon which Rome depended, under Roman rule. In 115 C.E., Alexandria was destroyed during the Jewish-Greek civil wars, giving Hadrian and his architect, Decriannus, an opportunity to rebuild it. In 215 C.E., the emperor Caracalla visited the city and, insulted by satires directed at him, abruptly commanded his troops to put to death all youths capable of bearing arms. Christianity came to Alexandria early. Mark, who wrote the second Gospel, is said to have preached there. Several early Christian theologians, including Origen (c. 185–c.e. 254) were educated at Alexandria. The city’s Christian community continued to grow and resisted Rome's attempts to impose emperor worship. The city was the location of the first doctrinal dispute between prelates, Athanasius and Arius, over the nature of the relationship between Jesus and God. The pope of Alexandria vied with the patriarch of Constantinople for ecclesiastical preeminence in the eastern Roman Empire. A break occurred at the Council of Chalcedon in 451, and the Alexandrian pope Dioscorus was deposed. In the late fourth century, persecution of pagans by newly Christian Romans had reached new levels of intensity. Temples and statues were destroyed throughout the empire, pagan rituals were forbidden under punishment of death, and libraries were closed. In 391, Emperor Theodosius I ordered the destruction of all pagan temples, and the Patriarch Theophilus, complied with his request. One theory has it that the great Library of Alexandria and the Serapeum were destroyed about this time. The female mathematician and neoplatonist philosopher Hypatia was a prominent victim of the persecutions. Alexandria fell first to Khosrau II, King of Persia in 616. Although the Byzantine Emperor Heraclius recovered it a few years later, in 641 the Arabs, under the general Amr ibn al-As during the Muslim conquest of Egypt, captured it decisively after a siege that lasted fourteen months. In 645, a Byzantine fleet recaptured the city, but it fell for good the following year. The Muslim Arab conquest led to an exodus of the leading elements of the Greek population. The new Arab capital at Al-Fustat (later part of the modern capital Cairo) eclipsed Alexandria, which continued to flourish as a trading center for textiles and luxury goods, as Arab influence expanded through North Africa and then into Europe. The city was an important naval base for the Fatimids and Mamluks. During the fourteenth century, bubonic plague devastated the city, and earthquakes destroyed the lighthouse. The growth of the spice trade boosted Alexandria’s fortunes until the Portuguese discovered a sea route to India in 1498. After the Ottomans defeated the Mamluks in 1517, Egypt became a province within a wider empire. At that time, the canal linking Alexandria to the Nile was allowed to silt up, cutting the city's commercial lifeline. By the time Napoleon's French troops stormed the city on July 2, 1798, Alexandria was reduced to little more than a small fishing village. Alexandria remained under French control until the arrival of British troops, who won a considerable victory over the French at the Battle of Alexandria on March 21, 1801. After a siege, the city fell on September 2, 1801. 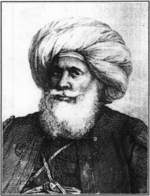 Alexandria's rebirth began when Muhammad Ali Pasha was appointed Ottoman viceroy and pasha of Egypt in 1805. In a bid to expand his power, he reopened Alexandria's access to the Nile by building the 45 mile (72 km) long canal, and built an arsenal to produce warships. He began rebuilding the city around 1810. Cotton was introduced into Egypt in the 1820s, and trade with Europe helped make Alexandria rich. The city became an increasingly important banking and commercial center, and by 1850, Alexandria had regained some of its former glory. The opening of the Cairo railway in 1856, the cotton boom that came with the American Civil War in the early 1860s, and the opening of the Suez Canal in 1869, meant that Alexandria emerged as an export hub. In July 1882, the city came under bombardment from British naval forces to put down a local nationalist revolt. This led to a British occupation that lasted until 1922. A self-governing municipality, founded in 1890, created the Greco-Roman Museum, constructed a public library, improved the street and sewage systems, and reclaimed land from the sea, upon which the waterfront Corniche was later laid out. During World War I, Alexandria was the chief Allied naval base of the eastern Mediterranean, and came close to being captured by Axis armies in World War II. Negotiations on the founding of the Arab League took place in the city in 1944. British forces left the city in 1946. The city was the point of departure for King Farouk, in 1952, after he was deposed in the revolution led by the Alexandria-born Gamal Abdel Nasser. In July 1954, the city was a target of an Israeli bombing campaign that later became known as the Lavon Affair. Only a few months later, Alexandria's Manshia Square was the site of a failed assassination attempt on Nasser. 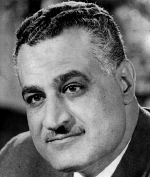 Nasser nationalized the Suez Canal in 1956. The failure of an attack on Egypt by British, French, and Israeli forces led to the seizure of French and British assets. Laws requiring the Egyptianization of foreign-owned banks, firms, and insurance companies led to the departure of thousands of foreign residents. 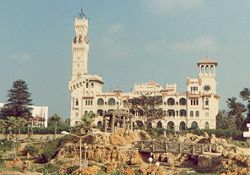 Nasser's industrialization program in the 1960s benefited Alexandria’s food-processing and textile-manufacturing industries. The Six-Day War, in June 1967, closed the Suez Canal and disrupted trade, adversely affecting Alexandria. The discovery, in 1976, of natural gas reserves offshore and in the Nile delta spurred industrial development. Al-Dukhaylah became a major iron and steel center. Refineries were upgraded, a crude-oil pipeline from the city of Suez to the Mediterranean near Alexandria was completed in the late 1970s. Another pipeline linked Musturud (north of Cairo) with Alexandria. The city of Alexandria is the capital of the governorate of Alexandria, in the Arab Republic of Egypt. Since the 1952 revolution, the president of the republic appoints the governor, who is assisted by an elected local council. The governorate is responsible to the Ministry of Local Affairs. There are also two cities under the jurisdiction of the Alexandria governarate: Borg Al-Arab city, with a population 186,900, and New Borg Al-Arab city, with a population of 7600. Over 50 percent of Egypt's foreign trade passes through Alexandria's two ports, Alexandria and nearby Al-Dukhaylah. Exports include oil, gas, and cotton, as well as fruits, vegetables, perfumes, and a variety of finished goods. The largest import is grain. The Alexandria city and district account for about 40 percent of Egypt's industrial production, and industry is the city's chief employment sector. Warehouses and the site of the former Cotton Exchange are located around the port. The asphalt works and rice and paper mills are located west in the Al-Qabbari neighborhood. Further west, in Al-Maks, are salt and tanning industries, an oil refinery, a cement works, and limestone quarries. Two refineries are located to the south, at Al-'Amiriyyah. Although some banks are based in Alexandria, most are headquartered in Cairo. There is a joint Cairo and Alexandria Stock Exchange. Alexandria is considered a main summer resort in the Middle East. The beaches, both public and private, of Alexandria are famous for cafeterias and umbrellas. Alexandria is served by the nearby Al Nozha Airport, located 7 km to the southeast, and the Borg al Arab Airport located about 25 km away from city center. An extensive tramway network built in 1860 is the oldest in Africa. The tram network is divided into two parts joined in the "Raml Station." Taxi drivers ignore their meters and let customers estimate how much the trip is worth, although travelers and tourists are usually over-charged. There are buses and minibuses. High birth rates and migration from the countryside meant the population of Alexandria grew 10-fold in the 100 years to the 1980s, reaching 4,247,414 by 2008, according to World Gazetteer estimates, a rank of 41 in the world. Population density is 1378 people per square kilometer. Arabic-speaking Egyptians make up most of the city's population. A polyglot French-speaking community made up of immigrants from Greece, Italy, Syria, and France, which represented about one-tenth of the population in 1947, disappeared following the nationalization of industries and services of the Nasser era. Most Alexandrians are Sunni Muslims, while the city's Christian minority consists mainly of members of Egypt's indigenous church, the Coptic Orthodox Church. Alexandria University, established in 1942, is located east of the city center. Classes are conducted in Arabic, although English is widely used. Léopold Senghor University, a private, French-language, international university, was inaugurated in 1990. The Bibliotheca Alexandrina was inaugurated in 2003, near the site of the old library. Little of the ancient city has survived. Much of the royal and civic quarters sank beneath the harbor due to earthquake subsidence, and the remainder has been built over. "Pompey's Pillar" is the most well-known ancient monument still standing. It is located on Alexandria's ancient acropolis—a modest hill located adjacent to the city's Arab cemetery—and was originally part of a temple colonnade. 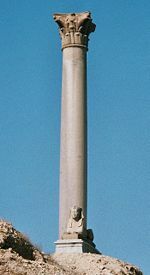 Including its pedestal, it is 30 m (99 ft) high; the shaft is of polished red granite, roughly three meters in diameter at the base, tapering to two and a half meters at the top. The structure was plundered and demolished in the fourth century, when a bishop decreed that paganism must be eradicated. "Pompey's Pillar" is a misnomer, as it has nothing to do with Pompey, having been erected in 293, for Diocletian. Beneath the acropolis are the subterranean remains of the Serapeum, where the mysteries of the god Serapis were enacted, and whose carved wall niches are believed to have provided overflow storage space for the ancient Library. Alexandria's catacombs, known as Kom al Sukkfa, are a short distance southwest of the pillar, consist of a multi-level labyrinth, reached via a large spiral staircase, and featuring dozens of chambers adorned with sculpted pillars, statues, and other syncretic Romano-Egyptian religious symbols, burial niches and sarcophagi, as well as a large Roman-style banquet room, where memorial meals were conducted by relatives of the deceased. The catacombs were long forgotten by the citizens until they were discovered by accident in the 1800s. 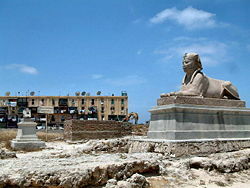 The most extensive ancient excavation under way in 2008, in Alexandria is known as Kom al Dikka, which has revealed the ancient city's well-preserved theater, and the remains of its Roman-era baths. Since the modern city stands atop the ancient one, it is almost impossible to find any considerable space in which to dig, except at enormous cost. Also, the general subsidence of the coast has sunk the lower-lying sections of the ancient town under water. This underwater section, containing much of the most interesting sections of the Hellenistic city, including the palace-quarter, is still being extensively investigated by the French underwater archaeologist Franck Goddio and his team. It raised a noted head of Caesarion. These are even being opened up to tourists, to some controversy. The spaces, however, that are most open are the low grounds to the northeast and southwest, where it is practically impossible to get below the Roman strata. The most important results were those achieved by Dr. G. Botti, late director of the museum, in the neighborhood of “Pompey's Pillar,” where there is a good deal of open ground. Here substructures of a large building or group of buildings have been exposed, which are perhaps part of the Serapeum. Nearby immense catacombs and columbaria have been opened which may have been appendages of the temple. These contain one remarkable vault with curious painted reliefs, now lighted by electricity and shown to visitors. The most notable find was a great basalt bull, probably once an object of cult in the Serapeum. Other catacombs and tombs have been opened in Kom el-Shuqafa (Roman) and Ras et-Tin (painted). The German excavation team found remains of a Ptolemaic colonnade and streets in the north-east of the city, but little else. Hogarth explored part of an immense brick structure under the mound of Kom el-Dika, which may have been part of the Paneum, the Mausolea or a Roman fortress. Empereur, J.-Y., and Stéphane Compoint. 1998. Alexandria Rediscovered. New York: G. Braziller. ISBN 9780807614426. Foreman, Laura. 1999. Cleopatra's Palace: In Search of a Legend. Del Mar, CA: Discovery Books. ISBN 9780679462606. Forster, E. M. 1961. Alexandria: A History and a Guide. Garden City, NY: Anchor Books. Haag, Michael. 2004. Alexandria City of Memory. New Haven, CT: Yale University Press. ISBN 0300104154. Pollard, Justin, and Howard Reid. 2006. The Rise and Fall of Alexandria: Birthplace of the Modern Mind. New York: Viking. ISBN 9780670037971.